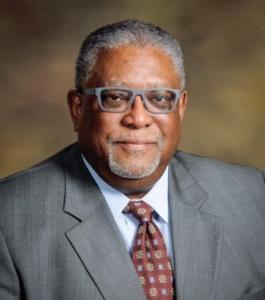 Born in Mississippi and reared in Gary, IN by activist parents, DeWitt Walton is a 25-year employee of the United Steelworkers (USW) and is currently assigned to the Civil & Human Rights department. He has served as an Organizer, Strategic Campaigner and as an Assistant to the International President. His responsibilities include increasing union membership along with strengthening the historic link between organized labor and the Minority community and he brings a broad range of experiences in community and political mobilization; Dewitt joined the Young Democrats in college and continued to work on social justice and political projects. An alumnus of Idaho State University, in 1971 he joined VISTA (Volunteers in Service to America) the domestic equivalent to the Peace Corps. DeWitt returned to Gary, Indiana in 1976 to work for Inland Steel Co. where he became active in both his local union and community organizations. He served in a number of capacities in his local union including Political Education Director. In 1990, the United Steelworkers union hired DeWitt as an Organizer for the United Steelworkers of America and in 1995 transferred to Pittsburgh where he has worked on and directed projects that have taken him across the United States, and Europe and Africa. Currently DeWitt serves as an Assistant to the International President for the United Steelworkers. Continuing to practice the principles of building coalitions between Labor, Activist and Community groups, DeWitt served as a National Board member of Americans for Democratic Action (ADA), President of the Pittsburgh chapter of ADA. Currently he serves, as Vice President of the Pittsburg A. Philip Randolph Institute (PAPRI) is a Board member of the Thelma Lovette/Centre Ave YMCA, Three Rivers Waterkeepers and Schenley Heights Development along with A P+ Schools. He continues to be active in the Pittsburgh Alumni Chapter of Kappa Alpha Psi Fraternity. In his USW, APRI and Kappa Alpha Psi roles, he created a partnership with the Housing Authority City of Pittsburgh (HACP) that focused on efforts to empower HACP residents and communities economically, educationally, conduct mentoring programs for children of residents and build better information sharing systems for the residents of those facilities. He also serves as Program Director of the Pittsburgh APRI’s “Breaking The Chains of Poverty” workforce development program. DeWitt lives in the Hill District.